Personally, I think this is one of the clearest contradictions in the Bible. Why does the Bible give us Jesus’ genealogy? I can think of no other reason than for it to serve as proof of his descent from David. But it fails this purpose since we’re given two differing genealogies that both claim to come through Joseph. Some have tried to answer this by saying that Matthew 1:1-16 records Joseph’s true genealogy and Luke 3:23-38 records Mary’s. They surmise that Mary must have been the only daughter of Heli (Luke 3:23); therefore, Joseph counts as his only heir, or “son.” They make the case that since Mary was a woman, she would not have been included in this genealogy. But if that’s the case, why does Matthew’s genealogy mention Tamar, Rahab, Ruth, Bathsheba (listed as the “wife of Uriah”), and even Mary herself? Others have said that the genealogy has nothing to do with Mary, but that Joseph has a real father and a “legal” father due to a levirate marriage. This view contends that Luke’s genealogy is the legal, but not biological genealogy of Joseph. But if either of these scenarios is true, why doesn’t the Bible simply say so? I’ve had some people tell me that these differences weren’t important to ancient readers of the 1st and 2nd centuries, and if we could look at it from their perspective, we wouldn’t be bothered either. However, this is absolutely untrue. We have writings from several different early Christians (as early as the 2nd century) that try to hide or explain the divergence in various ways [src1, src2]. If ancient people were truly not concerned with this issue, then why waste time explaining it? Regardless, even if this hadn’t been an issue for ancient readers, God would know that it would be an issue in more modern times. Why not offer a little more explanation in Matthew or Luke so that we could know how these genealogies fit together? As it stands, we have no evidence to help us make sense of them. The only way that this won’t bother someone is if they choose to ignore it. Or they could use the circular argument that God doesn’t make mistakes, and since he authored these passages, they don’t contain mistakes either. Of course, this is no better than clamping your hands over your ears and screaming “I can’t hear you! I can’t hear you!” whenever someone says something you don’t want to hear. I think if the Koran offered such different genealogies for Muhammad, Christians would say it was proof that the Koran was not inspired. Why should we give the Bible a pass? The statement here is not true. First of all, according to Matthew’s list, there are only 13 generations between the deportation and Christ, unless you count Jechoniah again. But the bigger problem is that Matthew presents this statement as though this were a divinely guided pattern showing us that Christ truly came at the appointed time. But he only gets these numbers by omitting people from the genealogy. Therefore, his statement is not factually true. There was no pattern in the genealogy as it is recorded in the Old Testament. Why would a divinely inspired writer lie about the number of generations? If God had really wanted the genealogy to come out to this neat 14, 14, 14 division, why didn’t he just make it happen that way? Instead, this does nothing but confuse those who think the Bible is supposed to be completely true and inerrant. Matthew is obviously manipulating the records to add validity to the claim that Jesus was the Messiah. In other words, he’s lying. As we said at the beginning of this post, the primary purpose for including the genealogy is to show that Christ really came from the line of David. But when the two genealogies disagree with no explanation to reconcile them, and when Matthew slyly manipulates the list to make a theological point, how do these genealogies fulfill their goal? There would essentially be no point in including them. The Bible says that God is not the author of confusion. Therefore, I don’t see how he could be the author of these genealogies. It seems to me that the two genealogies are different because they were written by two different people from two different traditions, and they didn’t expect their writings to be put into the same book. They probably weren’t even aware of one another. If you believe that the Bible is God’s word, then you should also believe that he wants people to understand and believe it. How is that possible in the face of such contradictions? Would a loving God really operate this way? We’ll examine another contradiction in the next post. I have read some explanations for the omissions in Mathew’s genealogy that say it was common in Jewish cultures to exclude certain names when referencing forefathers or someone’s relation to those fathers. For example, one could say that Joseph was the son of Abraham or that Abraham was Joseph’s father. This would be true, even though Joseph’s actual father was Jacob with Isaac being Joseph’s grandfather and Abraham actually being Joseph’s Great-grandfather. I can see where this has been used and I find it plausible, however I do believe this is a different circumstance than when listing a genealogy. The example listed above would be more of a casual tone where someone is jumping to the end of the story, so to speak, to give a brief acknowledgement of that person’s heritage. When giving a genealogy, like in Mathew and Luke, the point seems to be to provide proof and validation. By skipping names or by giving a completely different line (Luke’s) there is no proof, but discrepancies. Someone wanting to verify Christ’s linage after reading Mathew’s claims would only find inconsistency and with Luke’s would find outright contradiction. Besides, had the bible listed all of the names and there had been no variances, then there would be no question regarding the genealogy. None. Such a simple fix. In fact, I have heard others claim that this could not be a contradiction because it is such an obvious problem that it would have been caught by the authors. So, is this too obvious a problem to be problem? Thanks for the comment, William. And you’re absolutely right. When people start using the excuse that a problem is too big and obvious to really be a problem, they need to step back and ask themselves if they’re thinking clearly. You know, this whole question about the Bible is actually very simple. The claims within it are quite fantastic, so it should require extremely good evidence to be convincing. The problems I’ve been laying out are so obvious, that the fallacies in the Bible should be clear. But so many people are raised to believe it, and they’ve been told that true righteousness comes by faith. So if they can believe the fantastic even when it makes no sense and conflicts with the evidence, how great their faith must be! I find it very tragic. Given one’s assumptions about the reading of texts and about the Bible as a whole relative to what we think it should look like if coming from God (which are taught in many churches of Christ or other conservative groups – fallaciously so, in my view) – I can understand the problems and issues here. A couple of points. First, a general observation related to my point above. When we enter into the discussion with an a priori belief that, “If the Scriptures are from God then they will look like X not like Y and since they look like Y, they can’t be true,” we will arrive where the assumption leads – ultimately where we want it to lead. In essence, the assumption drives the conclusion. The real question is, how do we know anything of God or how can we place such expectations on God or his word – unless we have some prior knowledge about Who are What he is and about how should have chosen to reveal his word to us? I simply don’t think we can make such assumptions unless we already have some special divine insight into God prior to reading the scriptures (this sword cuts both ways; both for the skeptic who sets up the equation in just this way – such that it will fail – often just as he/she hoped; and for the believer who also does the same – and is driven to hold numerous contrived beliefs that cannot stand the test of scrutiny either exegetically or scientifically). When believers do this, it is inevitable that it will destroy the faith of many. And, if we are eager to hold onto such assumptions no matter what – well then, we will arrive at the conclusion we want to arrive at. Again, true both for believers and non-believers. Second, as to the specifics of this case, there are other assumptions brought to the table in your above post, it seems to me. One is a literalist reading that is all too common in churches of Christ and other conservative denominational groups. Matthew’s 14 generations, given such assumptions, become a ridiculous error. It’s why those in such groups must abandon their assumptions (and these are assumptions about reading texts, not supported conclusions). In essence, we are reading into the text our modern cultural assumptions. The reality is, Matthew’s 14 generations are contrived for a literary-theological purpose. They are not intended as straightforward history as our enlightenment, Baconian-common-sense-realist assumptions dictate. Rather, this was a common Jewish practice using numerology (it’s also seen in the “ten” generations in Gen. 5 and 11). There are even liberal scholars who don’t accept inspiration who nevertheless recognize what Matthew is doing and are not troubled by it. The three sets of 14 are multiples of 7 and serve to both highlight key turning points in Jewish history as well as bringing the reader through six “sevens” down to the seventh seven who is Jesus himself. Just a literary tool. One that a reading with modern assumptions about what a historical text should look like will not readily understand. The same mistake is made with the book of Revelation when it’s figures, numbers, etc. are taken literally. You might also consider what scholar Richard Bauckham has noted on the subject in that Matthew’s genealogy was more likely an official record that would have been kept in the Temple but Luke’s was likely a family record with differing names (or rather, a different line from Joseph – through his grandfather). Some would have traced lineage through Solomon others through David’s son Nathan. This is not uncommon in Jewish circles. The key to understanding these matters is not what second century Christians wrote, but how first century Romans and Jews viewed history (Luke is very much in line with a Roman history of the day). Neither are intending to be straightforward histories, per se. They are intending to be historical but they are theological-histories. Don’t know if you’ve read Bauckham’s works on the gospels (especially his Jesus and the Eyewitnesses; or The Jewish World Around the New Testament); or, N.T. Wright’s trilogy: The New Testament People of God; Jesus and the Victory of God; & The Resurrection of the Son of God. I think any critical evaluation of the gospels has to work through the writings of these scholars and others before drawing hardened conclusions – we are all works in progress in this world. Just a suggestion of some readings you might pursue, time permitting (there are many books on apologetics I would not recommend; but one I would, if you are interested in pursuing this, is Reason for God by Timothy Keller – a very accessible book on the subject – and quite unique relative to most other books). Best wishes and blessings in your pursuit! In reading your post, I have several questions that come to mind. 1. Is it an assumption that the Bible is God’s word? I know that it is said to be and is believed to be, but did God tell you it was or did you see God deliver it? If not, wouldn’t it also be an assumption that the Bible is from God, on our end? 2. I would agree that we would have to know something about God before we can attribute qualities to him or before we can determine what he would write, but the impression I had from the author of this blog was that he thinks that the qualities attributed to the Bible God from the Bible do not seem to cooperate in many instances. In other words, the God of the Bible doesn’t seem to match the God of the Bible. Since the Bible says that its God is perfect (I would also imagine God to be perfect), how many mistakes should we expect in something he delivers? 3. Should we believe anything as long as an explanation can be made for any seeming contradiction or mistake, whether in the Bible or Qua’ran or an eighth grader’s copy of Earth Space Science, that cannot be dis-proven? It seems to me that nearly any error or discrepancy can be explained away and the easiest way is to play the “literal/not literal card” or the “imperfect creations cannot fully comprehend a perfect creator card.” Even if that explanation were very far-fetched it wouldn’t matter, because nothing would be impossible with God, so then really every possible or impossible solution would work to maintain a faith or a belief despite the actual evidence. Yes the genealogies can be explained away if you want to believe it, but would you believe the Qua’ran if your issues with it were explained away? And why couldn’t both the Qua’ran and Bible be from God at the same time, is anything impossible for God? Thanks so much for the well-reasoned comment! I haven’t read the books you mentioned, with the exception of Reason for God by Timothy Keller. I did read that one. And I’ve read several other books that deal with the genealogy issue. Honestly, I just don’t find them very convincing. The main reason I have a problem with them is that even if Matthew had a point he was making with numerology (I’m also aware that he may have been referring to David since DVD is the number 14 in Hebrew), that will only resonate with a very few people throughout history. Most of us, if we bother to check, will see that none of the genealogies are in agreement with one another. We’ll also be able to see that Matthew claims there are 14 generations between certain events when there really weren’t. It seems to me that it only destines people to be led astray by it. So I really don’t think it’s placing an unnecessary burden on the text to expect it to be completely accurate. If we were talking about the best way to make chicken salad, then it wouldn’t be a big deal if some of us misunderstood the recipe, or got just a little of it wrong. But we’re supposedly talking about eternity. I think the stakes are too high for these things to work out “with a certain point of view.” If they’re true, they should be obviously true. But where do we get this knowledge? It seems to me that Christians often assume the Bible must be true, but also without this divine insight that you reference. Since I’ve never received divine insight, I just have to look at the Bible for what it is. In fact, I think we should all approach the Bible as somewhat of an agnostic — maybe it’s true, maybe it isn’t. We can only find out the truth through objective investigation. That’s my attempt here. As you said, (and I like the way you phrase it) we’re all works in progress here. I couldn’t agree more. Incidentally, that’s one of the reasons why I no longer think God (if he’s out there) actually expects us to figure it out. I really appreciate the time you took with your comment. It’s well thought out — you’re obviously someone who takes it seriously. I hope you continue to follow the blog as you have time. Take care! 1. I don’t think one can “assume” the Bible is the word of God. My own view is that the gospels are credible histories (several pieces of evidence convince me of this) and that the historical evidence for the life, teachings, death and resurrection of Jesus is convincing. Convinced of this, I believe Jesus is who the gospels claim him to be. And, that he, Jesus, accepted that the Scriptures are ultimately from God (cf. e.g., Luke 25:25-27, 44-45) and other points. – First, I would say that many of the alleged “mistakes” are explicable (such as the alleged mistaken or contradictory genealogies). – Second, if the answer to the first question is true (that Jesus is the son of God, God in the flesh, risen from the dead – and that really is The Question), then one need not chase every rabbit hole. It’s ultimately a waste of time. Either Jesus was risen from the dead or he was not. If he wasn’t, let’s not waste any more time. If he was, then we can accept the Scriptures on faith but not bury our heads in the sand – and work through, over time, various potential problems. We will also find, in process, that some of the presumed “difficulties” or “contradictions” are a product of assumptions we have made. Third, I think the assumption (which both believers and non-believers make) about the Scriptures that if they are Divine in origin it would be as though they fell from the sky as God’s dictated, holy words to us – that they are ahistorical, a-cultural documents – so, they should be “perfect.” But, this is neither what they purport to be nor, what they are in reality. God chose to use human beings, living and thinking in their particular cultural, historical, geographical circumstance to reveal himself and his word through them (1 Cor. 2:7-12). In spite of their revelation within such circumstances – which naturally particularizes the Scriptures – they still are just what God wanted (as several Scriptures claim – assuming for the sake of argument they were from God). – Much more to say on this but hopefully that helps explain my view on that. 3. The problem I have with this question, William, is that the explanation (non-literal figurative language) that I have given is not just an arbitrary attempt to explain away a contradiction. – First, we should only accept explanations that are reasonable. Just as occasionally a witness’s account may appear to contradict itself at some point. But, when further explanation is given that is reasonable then it is accepted. Lawyers are experts at exploiting presumed contradiction in a witness’s testimony. But, that doesn’t mean it’s true. – Second, to my initial point, the non-figurative language of Matthew is not just an arbitrary attempt to explain away a contradiction. It’s language that is common place in Jewish writings both in the OT and particularly more common in Jewish writings in the first century B.C. as well as A.D. Both in historical and apocalyptic. Scholars have long understood this. This is not as you presume it to be (a “made up attempt” to deal with contradictions). – Third, the problem we have here is that in our culture, such figurative, non-literal language is not commonplace. We operate under certain cultural assumptions about our writings, etc. The ancients operated under an entirely different set of assumptions. To lay our assumptions about how we think language “should work” or “works in our day” over top these ancient documents is to essentially rip the documents from their context. My point was not so much an attempt to explain a presumed contradiction as much as to correct an ahistorical reading that failed to account for the literary context. We must do this with each other in all our communications. When we fail to do so – we wind up misapplying each other’s words unfairly. This last point is highly significant for any study of these documents in the Bible. Believers and non-believers alike have attached innumerable false views or perceptions to these documents by failing to read them in their historical, cultural, and literary context. Thanks! Thanks for the comments and response, Nathan. Just a couple of follow up points. – moral assumptions will often interfere (a sword that cuts both ways – some, wanting to uphold a certain set of moral rules – say, no alcohol, ever! ; others wanting to be free from the Scriptures moral code) and prevent us from an honorable reading. – family or church influences (positively or negatively). We may be more skeptical or more believing based on either an emotional frustration with family or church settings; or a strong attachment to family heritage. – assumptions about what a text “should” look like – based on many modern perspectives that we attach to ancient texts (again, both believers and non-believers make this mistake). What happens in such cases is that we “think” we are being objective when in fact we are attaching our assumptions to texts. We are all guilty at times. I think the issue here partly relates to how one defines “completely accurate,” or what is “inaccurate.” When we get into ancient literary techniques, we can’t lay over top these texts our modern assumptions about how written language “should work.” All scholars of ancient literature – completely outside the study of Biblical texts – recognize this. If I went to a university and wrote a paper on some ancient Greco-Roman text that assigned my own assumptions to the text and did not respect the literary techniques and styles of the writers – then critiqued them on the basis of those assumptions, it would not fly. And scholars of Biblical texts who are non-believers fully recognize these points. Robert Alter (one of the finest OT literary scholars alive – at Cal Berkeley) recognizes this point. As a result, his insights into OT texts are tremendous b/c he respects the literary genre – he doesn’t do so to support some belief. Yet, he actually counters some presumed errors among modern readers because he understands the literary style and genre of the text. In essence, when we say, “completely accurate” – well, that depends first on what the expectations of the writers and ancient readers themselves had about such texts. It was more common place for genealogies to involve a literary technique that was not intended to necessarily include Every generation. Some of this, at times, was due to just the information they had available (in other words, a writer knew of a grandfather of one person, but not the name of the father – but it wasn’t a problem to them, so it shouldn’t be to us). Other times, it was a matter of literary function (this is the case in Genesis, Matthew, Revelation – and other ancient Jewish and Babylonian texts). The problem here is that of placing our own arbitrary expectations on a document that is not necessary. In other instances, the Biblical writers, as with other ancient texts (including Babylonian and Egyptian texts), did make extensive use of numerology – in genealogies and even historical texts. This is undeniable. They did so in a way that is not commonplace today; so we tend to struggle with such language. In that sense they are not “inaccurate” – they are just recording things differently than we would. Of course, Matthew’s genealogy was “contrived” but we should respect that it came to us through an ancient writer. When we take our assumptions about how “we” would write a genealogy (to be perfectly accurate) and apply it to these texts, we are making assumptions about the texts that these writers did not and doing an injustice to them. If we assume that “God would not give his word in this way so it can’t be from him,” well that’s our choice to do so, but I don’t anything that necessitates that. Another book I would recommend that touches peripherally on this point – along with both N.T. Wright’s works and Bauckham’s works – is one by Peter Enns entitled, Inspiration and Incarnation. This is not a perfect analogy but it is functional as far as it goes. We often use accommodative language or say things that are not absolutely accurate. When the weatherman tells us that sunrise will be at 6:06 a.m. and sunset will be at 7:15 p.m. no one freaks out about the clear fact that this is a completely “inaccurate” statement. We also would think it both unwarranted and unfair if someone 1000 years from now picked that up and said, “These people were inaccurate and unknowledgeable about their world.” The fact is, the sun does not rise nor set. The earth rotates. But, we use this ‘accommodative’ language. If we are speaking scientifically, it is inaccurate. If we are accommodating ourselves to our anthropomorphic perspective – well then we accept the language. We don’t expect people to write into the TV or radio station or newspaper complaining about the incorrect language. Why? Because we understand the context. In this respect the analogy of different maps helps. There are a number of different types of maps: topo maps; road maps; satellite maps; etc. We don’t say a topo map is inaccurate if it doesn’t show a road on it. And, we don’t say a road map is inaccurate because it didn’t account for a shift in elevation. This is where I think your concern with Matthew is not warranted. It is applying the criteria or expectation of one “mapping technique” to a different sort of map. (a particularly literalistic – Baconian one. Ironically, also a common interpretive approach among many/most C of Cers – who read texts without regard to their historical setting; cultural particularity; or literary genre – and then create unfortunate expectations as well as occasionally distorted implications of texts – this is especially true with the unfortunate literalist readings of Genesis 1). Some will say, “Well if I were God I wouldn’t give a text in such a cultural setting.” But, again, that is a human assumption. One of the most potent features of God – as witnessed in Jesus (and the evidence for him is the foundation and reason I believe) – is that he lowers himself to human circumstance and culture. There are, even stated within the Scriptures, several theological reasons for this; yes, it is surprising to us but so was the picture of a Messiah born in such poverty. This has long been a stumbling block – but it’s not asking us to throw out reason or evidence. But, I believe there is certainly evidence enough of the life, death, resurrection of Jesus that is sufficient for belief. Again, hope you’ll get a chance to read through some of these books and others (Another one that may be a bit difficult to get hold of is Inerrant Wisdom by Paul Seely). All the best. – Now back to NCAA basketball! Thanks again for your comments. You make a lot of points, so I’m not going to try to take them one by one — but luckily, most of them revolve around specific themes, so I’ll try to talk about those briefly. Oh, as an aside, I’ve also read Inspiration and Incarnation by Peter Enns — good book! I haven’t read the others, though I’ll try to get to them. First of all, I find the gospels’ discrepancies to be big enough that they keep me from believing the resurrection is a historical event. And that’s probably the biggest difference between our perspectives. I actually agree with a lot of what you say about letting documents speak in their own context and historical settings. I do think it’s important to allow them that ability, if we hope to understand them. But this is still one of the problems I have with the notion that God inspired the Bible. For example, if numerology, skipping generations, etc, were all aspects of how Ancient Near East writers and readers dealt with genalogies, then why should I think they were written by anyone other than Ancient Near East writers? This same generation of people had Jesus, apostles, and miracles. On top of that, they get written accounts that fit perfectly within their cultural ideas about how texts like that should operate. What do later generations get? We don’t have Jesus, apostles, or miracles. On top of that, the texts we have are written in ways that appear misleading to us. How badly does God want us to understand it? Christians believe that God spoke directly to heads of households in the days of the patriarchs. If he decided to finally stop doing that and just give his revelation once and for all, wouldn’t it be in a form that would be rather readily understandable to all peoples? To use your map analogy, topographical maps, road maps, and satellite maps are usually marked (or labeled) in a way to make them easily recognizable. Yet the Bible says nothing about why the genealogies are different or why Matthew says there was a 14, 14, 14 division when there really wasn’t. I’m not saying that the possibilities you laid out are unreasonable. I just don’t understand why the Bible wouldn’t say that for itself, if those were really the answers. A lot of it for me comes down to this: I know that if there was an all-important message that I needed to get to my children, it would be as clear as I could possibly make it. There is absolutely no way that I would allow it to be vague or misleading, in the chance that it could cause any of them to miss it. Christianity teaches that God loves us even more than I love my own children. Therefore, it’s no great leap to say that God would make sure his message to us is clear. I’m convinced of that. And the problems I’ve been laying out in the last several posts are anything but clear. Well, I should rephrase that. The clearest understanding of them is that they’re discrepancies. The “answers” to them are anything but clear. Earlier, you said that none of us is able to completely remove our assumptions when we look at things like this. I agree with you — though some of us try harder than others. But it’s the fact that we all fail so miserably at separating our prejudices and presuppositions from objective reality that makes me question whether God would actually require it of us. The fact is, none of us knows any of this for sure. We’re all going off a mixture of assumptions, reason, wants, emotion, culture, intelligence, etc. And we all want to know. To me, it seems that no just God would set the stage this way. It holds us all accountable for so many things we can’t even help. I’m not saying we’re completely helpless or innocent, but I do think the task is way above our ability. I’m sure there’s more that could be said, but I’ve rambled on long enough. Thanks again for your comments. They’re well-reasoned and well-studied. I really appreciate that about you, even if we don’t completely agree. I realize this is a very old post, but on the off chance that this has not been resolved in the eyes of the author yet, I thought I might chime in. Although the average person today reads from a translation of the Greek texts, the evidence for Aramaic being the original is over whelming. Aramaic was the language that Yeshua and the apostles spoke. The account given by Matthew was Mary’s genealogy, and Her fathers name was Joseph. This is the reason it appears the segment is short with 13 instead of 14. The Aramaic word gowra can be used for father, husband, son, or man, and if you study the original text it becomes clear that there were 2 Josephs, and one was her father. Thanks for the comment. I’ve heard of this explanation before, but I’m not aware that there’s any evidence to support it. As you said, if we could study the original text, it might clear up this particular problem, but since we don’t have the original text, this explanation can still only be categorized as supposition. Plus, even if Matthew was trying to give the genealogy through Mary, his 14, 14, 14 scheme still doesn’t really pan out, since Chronicles shows that there were more generations than that. Thanks again for the comment, and feel free to chime in any time! The generations are not off. The first two have 14 and the 3rd has 13 if you believe Joseph her guardian was her husband, but if you study the original text you will see that gowra is her father which makes it 14. Could you specify which manuscript has the word gowra? Again, we don’t have the original manuscript of Matthew — so I don’t think it’s a given that gowra was actually used by the author. 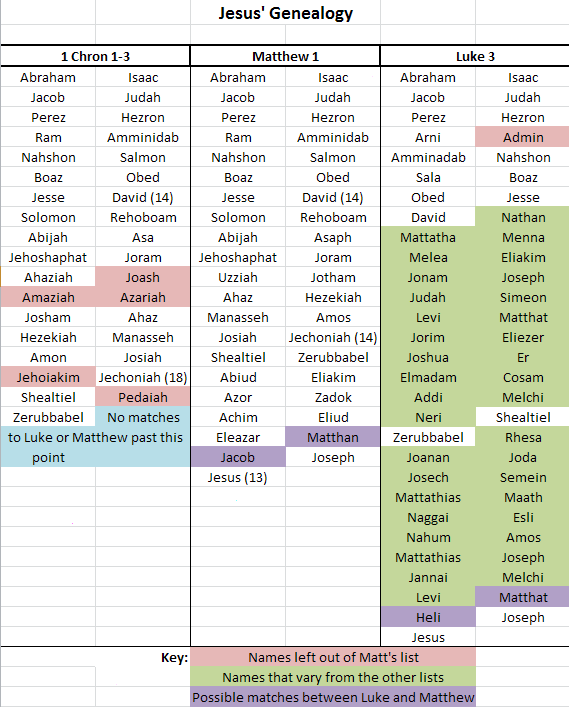 My point about the counts being off is that 1 Chronicles also gives the genealogy, and Matthew has to omit a few names to get the counts down to 14 in one place. So the genealogies did not actually fit the 14, 14, 14 breakdown that Matthew claims. His version is a fabrication. I am typing this on my phone, which is very painful, so I have to make this brief but hopefulhis will help. Matthew wasn’t just writing a genealogy, he was also establishing the king line. A pious Jew would be very well versed on a topic like this, but most people would have very limited understanding. The king line goes through David, but he wasn’t the first king, Saul was. Because Saul did not follow God he was removed and the title given to David. He was also cursed and non of his line was to reign again 1 Samuel 28:16-18. Jehoram also disobeyed and married the daughter of Ahab. But because God had made a promise to David Judah was perpetually blessed, and he could not remove his house like he had done before. So according to the 10 commandments in Exodus 20:4-5 his children were cursed and not allowed a place in the line of kings. Let me know if that needs more attention. As for gowra it can be found in the Aramaic of the Peshitta. The reason absorbant we c can be sure it refers to her father is that a few verses later when talking about her husband it uses the word baal which can be nothing but a husband. Thanks for the additional information. Could you also provide info on the evidence that Matthew was originally written in Aramaic? I know that the people in Palestine spoke Aramaic in Jesus’ day, but from what I’ve read, most scholars still believe the textual evidence shows that the gospels, including Matthew, were originally written in Greek, not Aramaic. Of course, that would cause problems for the gowra theory that you’re espousing. If you have any sources, I’d be interested in checking them out. And yes, if you could provide more explanation about why those particular kings were left out, I’d appreciate it. After all, if it was because they were also descendants of Ahab, then that fact would apply to all who came later, not just the 3 that were removed. I am not an Aramaic scholar my any stretch of the imagination, but I do study the word. From what I can tell, gowra is the most common way to say man, husband, brother, son, and father, with the context showing the meaning . Just like many words in English can be a verb and a noun, but when you read it in a sentence you can see which h meaning is being used. The commandment says he visits the iniquity of the father’s on the children to the third and fourth generation of those that hate him. Sorry I am slow, so be patient with me! As for the Aramaic, there are so many problems with the Greek that do not occur in the Peshitta. That alone would suggest that the Peshitta came first. Also the Aramaic is of a poetic style, so when people say “something was lost in the translation” here it is quite true. I do not know how to post a link with my phone, but search it out if you can. Ah, okay, I see what you’re saying. It would have been nice if Matthew had spelled this out, since there were plenty of other kings who didn’t follow God’s laws, but never had their descendants’ names left out of the genealogy. Plus, that commandment is extremely vague… what does he mean by “visiting the iniquity of the fathers on the children”? He also says “showing steadfast love to thousands [or thousandth generation] of those who love me and keep my commandments.” To me, it sounds like a poetic way of saying that he’s very merciful to those who serve him and is a harsh disciplinarian to those who hate him. I wonder if it was ever intended to be taken so literally. It also sets up an interesting problem since these kings were descendants of both Ahab and David. Should they receive mercy or punishment? And Ezekiel 18 says that God does NOT punish children for their father’s sins. Still, it provides an interesting explanation of why Matthew might have left those 3 out in his genealogy. I suppose he needed a reason to pick 3 people to get to his 14, 14, 14 division. I’ll continue to think about it — thanks for bringing it up. Also, whenever you have time, I would like to see what info you have on Matthew being written originally in Aramaic. He did not punish his children for his sin, because that would have been death. He did however allow them to be affected by the action reaction side of what happened. For example, if a woman chose to do drugs whilst carrying a baby, and that child was affected by a disability, it would be life long. It wasn’t their fault but the action had consequences that affected others. Ahab was meant to be cut off and by allowing that bloodline to infect the king line we see that it had consequences because of God’s original promise. Was Ahab in mathew’s genealogy? Wasnt he a king of Israel – not Judah? Maybe. The problem is that no passage anywhere spells this out for us. That might be what the writer of Matthew had in mind, but we don’t really know. William, Laurie is saying that Jehoram married Ahab’s daughter, thus the union of those two lines. what a confusing mess… at least I take comfort in knowing god is not the author of confusion. Yes. Matthew was giving the genealogy through Mary. I had not heard that before. And in the current bible it doesnt appear this way, but one derived from an aramaic text? What verses show it was through mary? This text says that yosip was her guardian, and this is takin from the word gowra. Do you believe the NT is scripture? I used to, but do not believe that any longer. Hmm, so you’re saying that in aramaic, the word that was translated as husband could mean father? interesting. I’ll try to look that up. I do wonder if Aramaic had a word specific for “father” and if so, why it wasn’t used… I’ll research it. Do you know whether luke’s genealogy would be different if interpreted from aramaic rather than greek? There are over 600 errors in the Greek new testament, that can be resolved translated back into Aramaic, but this is not why the Bible seems so hard to understand. Since you no longer believe, I will tell you what I think. After perusing that essay (and I’m not done yet) I read where the author says that Gowra basically means, as you said, “protector” and that in different stages of a females life it could refer to different people: when she’s a child or unmarried, it would mean her father, when she was married it would refer to her husband, if her husband died, it would refer to whatever male was caring for her at that time. Without dwelling on the fact that if what you suggest is true, there is a very easy way to have said it better, eliminating this area of debate, you’re saying that it makes the most sense for Gowra, in mathew 1:16, to mean father? Where the term father is used in every other instance in mathew 1, was it gowra or another term? Why wasnt gowra used for those if it was intended to mean father? And If another term existed that better represented “father” (as was sued in every other instance of matthew’s genealogy), then why not use that term between Joseph and Mary in verse 16? certainly, if an instance existed where Marry’s father/guardian and husband had the same name, a little more care would have been observed in clarifying the difference. I believe that Abba was an aramaic term that means “father,” and there may even be more terms that would better convey “father” than gowra besides abba. I suspect, but plan on researching more, that the author of the essay only looked to explain the mathew/luke genealogy problem because there is a matthew/luke genealogy problem. without any semblance of an error, no one would even have to try to solve it or to explain it. Again, this particular issue could have been negated so easily if the author of mathew and luke simply explained their own differences, explained what they meant exactly. If god was truly behind it, surely he would have foreseen the resulting issues and could have prevented it if he was so inclined. Yeshua warns in Rev 2 that there are false apostles and then gives a list of ways to identify them. They are liars, they teach to eat meat sacrificed to idols, they have a story that is similar to balaam. The Torah tells us that God will send a false prophet to test us to see if we will keep his commandments. It also tells us about the ravenous wolves that Yeshua spoke of, and that they are from the tribe of Benjamin. Yeshua had 12 apostles, and he said that the new Jerusalem would have twelve gates with their names, and they would sit on twelve thrones. Also their would be, 12 foundations. To most people bound by tradition this would sound crazy, and I’d probably be hung for heresy, but if you search for the truth, the truth will set you free. Paul was the creator of Christianity, and he along with Titus, Timothy, and the author of Hebrews are the very ones that Yeshua spent so much time warning us about. Take them out, and all of a sudden everything makes sense. Before I get into that, assume I am right, and I will explain the genealogy. Laurie, I am intrigued and would like to hear more. Is that right? No it is not. Elizabeth was a daughter of Aaron, that means that Mary was a Levite by blood. So why is Joseph her guardian? Because she was his adopted daughter and he had no son to carry on his name, by levirate law with no son to be heir the daughter can pass the lineage, where in all other cases that is not so. I don’t think Jesus had to have ties to Levi for his priesthood — at least according to the Hebrews writer, he didn’t. The Jewish people will never recognize their Messiah, because here we are teaching that he doesn’t fulfill the prophecy clearly laid out in scripture. In each passage you can see that it is talking about the branch who is a priest on the throne. Does that make sense? The author of Hebrews is wrong. On many levels not just this one. Was Sarah givin the promise because of her faith? Was Abraham righteous because of his faith? Forget about Paul for a moment, and read it out of the Torah. Sarah laughed at God, and so did Abraham. Why did God say Abraham was righteous? This is why YHWY told Isaac his father was righteous. Well, faith leads to obedience. Isn’t it splitting hairs to draw a distinction there…? First off, Paul teaches that we are saved by grace apart from works lest any man should boats. That is not what Yeshua or any of the apostles taught. Secondly, what Paul did here and so often in other places, is misquote the scriptures to teach what he wants and not what it says. Oh, I agree Paul misquoted some things. Though I think the gospels did a bit of that as well — Matthew more than the others. If large parts of the NT are false, how do you know the other parts are not? Following the original Hebrew syntax of this conversation, you can see that by Paul removing one of the words, “he” it completely changed the meaning of the text. In the Torah it says that Abraham believed God and counted it to him for righteousness, not the other way around. I have to say that it is in reading things like this that makes me breathe a sigh of relief that I am no longer dependent on trying to decipher the words of ancient superstitious people. Not only does everyone have their interpretation and style of hermeneutics, but everyone seems to have their own beliefs about what books should be included as the “canon”. Protestants decided that the Catholics were wrong in including the Apocrypha, Martin Luther tried to get rid of the “Antilegomena” (mainly Hebrews, James, Jude, and Revelation), and this spin to remove the writings of Paul, Titus, Timothy, and Hebrews. And the strange thing is that everyone who has their interpretation or list of canon declares that when others come to God with sincerity of heart and are completely honest in their search for truth then God will reveal their specific truth to them. I recognize these books written by the ancients as they are – words of imperfect humans. This seems to me to be the simplest and most probable solution to all the difficulties that everyone feels they need to solve with interpretations. The reason Martin Luther wanted to get rid of those books, was because he felt they were contrary to Paul. If you believe in a God and you believe in Salvation or a savior like I do, then there has to be answers that make sense. I lost my faith for a while when things didn’t make sense any more, but the more I studied the more I saw, and the clearer things became. I completely agree with Howie. I don’t believe in a God, and I don’t believe mankind needs to be saved from anything. Thanks again for your comments the last couple of days. Reblogged this on The BitterSweet End. and like paarsurrey said, if the koran (or any other religion) had two differing genealogies for someone, i suspect christians would use it to toss that religion aside as bogus. I stumbled across a spreadsheet I had made sometime back to help me wrap my head around this issue and one thing stood out to me. What stood out isn’t where the two genealogies differ, but where they agree. The two genealogies agree from Abraham to David, but then depart afterward until they agree again with Salathiel and his son Zorobabel before departing again until they once again line back up with Joseph and Jesus. I realize that the die hard believers will say that Luke’s Joseph really means Mary, but avoiding that one all together, is it even possible for two genealogies to depart, then reconnect and then depart again? In other words, even if Luke’s genealogy was truly Mary’s line (even though it clearly says Joseph), are the two genealogies even possible? Portal, do you have any thoughts or insights? Cool, William. It’s interesting to look at it laid out like that. Must’ve taken some work! thanks Josh, but no, it didnt really take that long. I just wanted to see them side by side. What are you initial thoughts? Oh, I don’t know that I have any thoughts on it. The genealogies were something that I questioned when I first started noticing that there were issues with the scriptures agreeing with one another. I went through different phases of varying adherence to apologetic answers to the genealogies and other issues. As I began, within the last couple years really, leaning more and more away from inerrancy I became less troubled by the contradictions. being a believer who doesnt maintain inerrancy is something i struggle to understand. Recently I created a wordpress page only to make an “about” section so that people could get a general idea of what brings me here. maybe explain why a book with errors can still seem like a trusted message from god, at least from your perspective? but i guess we’re all on our journey’s for truth. may we both reach that destination. >First of all, according to Matthew’s list, there are only 13 generations between the deportation and Christ, unless you count Jechoniah again. I think you’re meant to count Jesus as the 14th member of that list. Oh man, really sorry, I examined the Matthew passage and counted the names, and I thought adding Jesus on the end would make it 14. But now I’ve double checked it and even with Jesus, it’s still only 13. You were right, sorry for my mistake. The generations are correct, and I think earlier into the comments here we actually hashed that out, not positive though. The genealogy in Matthew is in fact Marys genealogy, and Joseph was her adopted father. Knowing that, you can count it, and the generations work out perfectly. I don’t read where it says Joseph was anything but Mary’s husband. Can you show me where I’m wrong ? Hi Laurie, nice to hear from you again! For what it’s worth, I don’t think we ever agreed on your theory about how to work out the number of generations. But johnroddy, if you’re interested in the discussion, you can find it in the comments above. The word in the text here is Orbg (gowra), with a 3rd person feminine pronominal possessive suffix of h.
It was not her husband, but her protector male guardian. In verse 19 the word husband is baalah, and not gowra. The word baalah can only mean husband, where gowra can be husband, father, son, guardian and so on. The context shows the meaning in verse 16. If it were her husband, than baalah would have been used like it was a few verses later. if the author was trying to show 3 segments of 14, it would make sense that he did that, and it was in fact a translational error. The real issue here is that, Joseph the husband of Mary was not his biological father, and so his genealogy would serve no purpose here. Further more, in Luke it says “Jesus the supposed son of Joseph, son of…..” So clearly, this is not Marys lineage. Because christianity as whole doesn’t study the Torah, this seems really nonsensical. But if you were to ask a Jew, to them it would make perfect sense. Mary was a Levite, and not from Judah. The first genealogy is her adopted father, who was in the king line. Her husband Joseph, descended from Nathan, and was not in the king line. So why, if he wasn’t the father, and isn’t an heir to Mashiachs throne, would his genealogy be in there anyway??? If you study this out in Torah, you will find that Marys child is only able to receive a portion of the inheritance (Judah) and claim the throne, if she marries a man from that tribe. So there is no reason for his genealogy in the text at all, except to show that Mary is fulfilling the requirements of Torah…..because he is not an heir to the throne. Yes, we didn’t agree on much! And that’s okay! But in this case, the issue at hand is really, that christianity and all the Christian translators, are not trying to find the truth, they are trying to force the text to conform with the truth they already no to be…true and correct! The reason they still can’t maker this work, is because they believe the book of Hebrews is inspired, and the author said the Anointed one was not from Levi, but from Judah, and that is why we have a new law and Torah was done away with. If that is what you believe, then the text will never work. Its not an issue of the inaccuracy of the text. Its an issue of translators trying to fit the square peg into a round whole, instead of changing their position. This explains why “virgin” should also be corrected in Isaiah 7:14 and since “almah” means “young unmarried woman” and not always “virgin” . It could also be an issue of bad writing. This is still an issue that could have been completely negated had the writer just been more clear – but it wasn’t written that way. Even if it’s just as Laurie says, or of it’s Luke’s that was Mary’s line like other apologists suggest, it involves so much wrangling, and so much additional study, and so much assumptions to conclude it’s all legit – it certainly ain’t clear. If we read the genealogies as they’re written, they’re a mess. And speaking of Hebrew words, Isaiah never said a “virgin” would have a son, but a “young woman” would. and Behold, in Isaiah 8, the chapter immediately following Isaiah’s “young woman” prophecy to Ahaz, a young woman gave birth to a son… So maybe Matthew was reading from a bad Greek Translation when he decided Jesus had a virgin Mother. It just takes so much effort to make it all make real sense. It can’t be taken at face value and the work it takes to get around these issues could work top fix any issue of any religion. I just can’t seem to buy it. Well, my view is a little different (from Laurie’s). I don’t find it surprising that there are so many wildly different ideas about who Jesus was, what God wants, what Christianity is, what the Bible says, which parts can be trusted, etc, because I don’t think any of it was ever inspired by any deity. Different authors wrote their opinions, often basing them upon a number of different sources. That’s why the Bible as a whole does not fit together. Even from your point of view, you have to dismiss certain books in order to build your case. I have a hard time believing that God would inspire some texts, yet allow them to be combined with others that aren’t inspired. So….did Mary have a husband ? If so , what was his name ? Couldn’t a “protector male guardian” also be a “husband” and visa versa ? “It could also be an issue of bad writing.” Excellent point William ! If God wanted to get his message out for the whole world to understand, he would eliminate this trillion dollar industry we call “organized religion” and just write indelibly on the sky, “be nice to everyone” END OF STORY. Right, he could have been clear. And i know all the devotees of each religion will argue and say, “He was clear!” it’s just that so many people from so many different religions and sects all the claim that as well, yet there are still so many variations. And for myself, I am truly looking and trying to identify what is right, whether I like it or not, and it doesn’t seem clear to me despite years of looking… It would seem that a perfect, all knowing and all powerful deity would be able to deliver a clear and concise message for all, if that’s what he wanted to do. Yes she was married to Joseph, and her adopted fathers name was also Joseph. Sounds wierd, but it happens sometimes. To me, it all makes sense. It also makes sense to me that Ya would let bad writings into the book as a whole. But most people will say exactly what you just said Nate. I get that, I really really do! Here is why this makes sense to me…. @Laurie, “Yes she was married to Joseph, and her adopted fathers name was also Joseph. Sounds wierd, but it happens sometimes. I just went to biblegateway.com and looked at all 54 English Translations listed for this scripture and all 54 translations refer to Joseph as Mary’s husband. This includes Mounce Reverse-Interlinear NT and the Orthodox Jewish Bible. And yet you are convinced it means otherwise. And you state it all makes sense to you. I’m sure you are a nice well meaning person Laurie, but why should I believe you when so many scholars believe otherwise ? Are you willing to concede there might be a chance however slight that you are mistaken ? YHWH warned in Deut 13 that he would send false prophets to test his people, to see if they would love Him and keep His commandments. There are several places that talk about the false prophet and what he would do, like add or take away from Torah, teach the children of Israel not to be able to discern between clean and unclean, remove the holy days like Shabbat and the feasts, just for a few examples. In the text of Deuteronomy 13 He says that he (false prophet) will lead them after another god that they have not known. So, with this verse in mind, lets look at some passages from Saul. 2 Cor 11:4 4 For if someone comes and proclaims another Jesus than the one we proclaimed, or if you receive a different spirit from the one you received, or if you accept a different gospel from the one you accepted, you put up with it readily enough. Gal 1:8But even if we or an angel from heaven should preach to you a gospel contrary to the one we preached to you, let him be accursed. Romans 2:16 on that day when, according to my gospel, God judges the secrets of men by Christ Jesus. This is just a few of the many verses, but what I would like to point out is that, here we see that Paul had a new gospel. That there were 2 different gospels and two different Jesus’. One teaching Torah, and one teaching something new, the law nailed to the cross. So here is my point… If Ya said “hey, I’m going to test you by sending someone that will do away with parts of my law” In the beginning, and then in Rev 2 messiah says the False Apostle has come already, and is teaching to eat meat sacrificed to idols and such, it would make sense that you could find this person or people in between the pages of that book. A test, for every person seeking Ya. I realize this takes time and study, and isn’t as fun or easy as “live a life of sin! If you believe on jesus you’ll be saved anyway”. the Orthodox Jewish Bible was written by a christian, and is not Orthodox nor Jewish. Especially since we don’t have any of the original manuscripts to begin with . I would think this is where Faith comes into play. Faith that what was originally written down was 1.) the truth, and that it was 2.) not altered in what you possess today. Laurie, what book would you recommend which has the scripture read, ” and Jacob the father of Joseph, the protector male guardian of Mary, and Mary was the mother of Jesus who is called the Messiah” ? I do not believe the “new testament” to be inerrant. I also do not believe it is necessary, but commentary rather. I do think it was inspired, and written just the way it was intended, but that it is not without error in the translations we have today.I don’t think it needs to be perfect, to teach us what we need to know. I think the most likely original was the old Syriac, with a Hebrew Matthew. I do read the Peshitta on occasions, as well as 10 or so others. I think most scholars are biased. I think the majority opinion is usually wrong. I’m not trying to tell you what to read or believe. I’m simply saying, if there are translations that solve the problems without causing more problems, they are probably right. Paul and his followers introduced all kinds of contradictions into the text. If you take them out, you will find consistency. Laurie, I think this statement tells me everything I need to know . I think we are done here. You might want to discuss majority opinions with unkleE. The best to you ! You don’t believe in Paul, but you think most biblical scholars are what… right? You think most scholars didn’t attend some type of college that indoctrinated them into a specific set of beliefs? I have discussed plenty with unkleE! Although we don’t agree on much, I quite enjoy his posts! Hey UnkleE! Are your ears burning?! Lol! Well…. I haven’t been around in a year or so, and thought I would swing by to see what you guys were up to! I suppose I will be on my way! Looks like Kathy left huh? Would love to hear why you disagree with Paul. Obviously I don’t either, but it’s cool to hear what you have to present (and then I’ll just take and throw it at my christian relatives/friends) whenever they disturb me. How do you know that NT is inspired if it is not inerrant? On what basis do you make the claim that it is inspired? Because Bible say so? What if the part where the Bible says it is inerrant is actually the errant part? Yeah, Powell, I think your question is really important. I was also thinking about that when Laurie quoted from Deut 13. Why should we assume that passage is correct, especially in light of all the known problems with the Bible, the OT in particular? hey Nate, I went to see my HIV doctor yesterday and I told her that Christians were driving me insane (for real, they really are) and she made me an appointment with a psychiatrist and then she prayed for me. lol..
that explains the ak/47 and the flamethrower. just so you know. I meant no harm. oh, and if god is real, that’s the WORST thing that ever happened in the history of everything. Here is what I consider to be even a bigger problem with the genealogies. Who carries 14 much less 42 generations of genealogy around with them? Are we really to expect that Adam’s grandkids dreamed up the concept of a genealogy? Adam didn’t need one, and his kids, the first generation wouldn’t have needed one, but someone of the next generation or soon thereafter must have foreseen a need to start keeping track of people from succeeding generations. So, if we assume Bishop Ussher’s chronology to be a bare minimum, and let’s assume he was actually right, that the Earth was created in October of 4004 BCE, then by Jesus birth day, there was approximately 4000 years of genealogy to have been kept through all the turbulent Genesis days such as the scattering of people from the Tower of Babel to the ends of the earth, culminating in the flood. Then Noah must’ve passed out copies of his forebears to his sons, who then continued the tradition of adding to the genealogies through hundreds of years of Egyptian captivity and enslavement, then through the Exodus, and then through 40 years of wandering, continually looking for a better campsite in the Sinai than the one they had the night before. One wonders, for being an illiterate group of nomads, how were they accurately keeping track of the thousands of births and deaths at this juncture? But somehow they continue keeping accurate records through Nebuchadnezzar’s captivity and all the various kingships and dynasties and the Maccabean revolts and the Roman occupation, and then, after Jesus birth, 75 or 80 more years until said genealogies conveniently fall into the hands of Matthew and Luke. How many of Joseph’s tribal kinsmen also kept their familial papers in order for 4000 years in hopes that the messiah would be born of their line? With all the modern advantages I have, I can’t trace my genealogy back much over 200 years. How credulous must one be to believe that ancient shepherds even gave a rat’s hind quarters about such things and could manage to keep these records, not to mention that Herod the Great burned the temple’s genealogies (according to Eusebius) some time after Jesus’ birth and before Herod’s death which couldn’t have been a span of more than a few years. No, sorry, didn’t happen. It’s all a concoction. You know, I haven’t really thought about in exactly that way before… great point! Brilliant. Sometimes the most simple things are often the ones overlooked. I have learned that when things don’t make sense in the bible, that it’s because I’m not a first century jew. Had I been one, I’d be okay with it, and now, with that knowledge, I should also be okay with it now. Hi Nate, this is my first visit to your site (discovered through searching for resources on the genealogies). Just thought I’d compliment you on the positive and gracious tone of your conversations with other people. You won’t be surprised that as a Christian I don’t agree with everything you say, but it has definitely been food for thought. All the best. I will certainly check in again. Please feel free to comment or email any time! There ARE 14 generations if you count Jesus. And he did not omit names from the genealogy. If you use the Septuagint, the old testament rendered in the 3rd century BCE which is older and matches more consistently with the Dead Sea Scrolls than the source that I am assuming you used, the Masoretic, then the geneology in Matthew does not omit names, as they do not occur in the Septuagint. Hi Annese, thanks for the comment. If you just start counting at verse 12, it’s easy to think the final group has 14, because you’d start counting with Jechoniah. But again, Jechoniah is the 14th person in the second group. We have a total of 41 names, but we’d need 42 to get 3 even groups of 14. I wasn’t aware of this, so thanks for bringing it to my attention. This is almost certainly why the writer of Matthew doesn’t include those names — the Septuagint is the version he would have been using anyway. At the same time, those other individuals are talked about in other passages in the Old Testament. 2 Kings 13 and 14, for instance, talk about the reigns of Joash and Amaziah. To me, that still shows that the list in Matthew is incomplete. There weren’t really these 3 14-generation groupings within the genealogy. you made an interesting point in regard to Matthew’s genealogy (on the other thread). I looked up the greek word used in Matt 1:16 for “husband” here: https://findingtruth.info/2011/03/11/contradictions-part-6-jesuss-genealogy/ and this source says that the greek word was “andra” not “aner” and means husband, not father or man…. what source do you have? does anyone know if man was ever used in this context to describe someone’s father? I can see why the Greek Scholars would translate it to “husband” considering the context. However, i’ll keep looking. it seems to always be husband or an otherwise unrelated male. Anyone else know help out here? hm, is “andras” the plural of “aner”? if that’s the case, then men or even fathers seems to make more sense than husband, right? and would fix the numerical issue with Matthew, yeah? I have decided that Greek is stupid language. There is a greek word for father, and it was not used. There is a greek word for husband and it is not used. Greek scholars who translated the text, saw “husband” as being the best translation, however I do recognize that translators are capable of making mistakes, like they did when they translated “young woman” in to “virgin” in Isaiah 7 – am I right? “Husband” would have changed the meaning, and I think “men” would have as well, but as we have it? I feel like Greek is stupid, along with the way the bible was written…. and in regard to the above about a greek word for man (maybe more than one) – I see where that may be confusing…. Nice job on this quick research, William. Thanks for the links and the play-by-play. I’ll try to look into it myself when I have some time. Tom, do you have any different sources? earlier, you said that the numbering in Matthew’s genealogy is off unless we count Mary. But I don’t think that’s correct. 14 Generations from the babylonian (again, 2) exile to the Messiah. From Jeconia (again), the Babylonian exile, to Jesus (the messiah), is also 14. So if we tossed Mary in there, then we’d have one too many. I made a spreadsheet, but i dont know how to post them here without getting them screwed up. nate, if you think it would help illustrate the issue, I could email the spreadsheet to you – but it may not be necessary. Well, I just sent it to you. I’ll look it over again, but look at verse 17. Abraham, so and so, and so and so to David…. yeah, never mind. Missing that one messed me up. You’re right. O Tom, where are you when we need you? I am using Strong’s concordance, which has it listed as ‘aner’, which can mean “fellow, husband, man, or sir “. Thayer’s has it defined similarly as “any man”, as well as the standard fellow, husband, man, adult man. It is usually translated as husband, but my point is that due to the context of genealogy, father would make more sense. The translators obviously chose husband for a reason, maybe bias; I don’t know. I believe “father” is more appropriate for two reasons 1. it fixes the problems with the text 2. the realization that the meaning of words can change over time, and that Kione greek was most likely used; of which was a dialect that varied greatly. When the translators translated the text the appropriate word seemed to be husband, however, as we see “Father” fixes the problems with the text. My point of view on this is obviously not widely held, but I have read articles from others that do hold the same opinion. No, thanks for the comment, but I’m not sure if you saw my other previous comments where I talk a little about the point you’re making? husband would seem to fix the numbering (although I believe Matthew’s genealogy are also missing people listed in the OT as being part of this linage), but it doesnt seem to fit with the rest of the text. For example, and as stated above, Matt 1:6 uses the work father, but it’s “gennao”, not aner or andras. So we know that Mary had husband named Joseph. Why not use a a more specific term, when “man of” seems to imply something different than parent of, especially with how it’s used elsewhere in the NT. It’s an remarkable piece of writing in support of all the online users; they will take benefit from it I am sure.